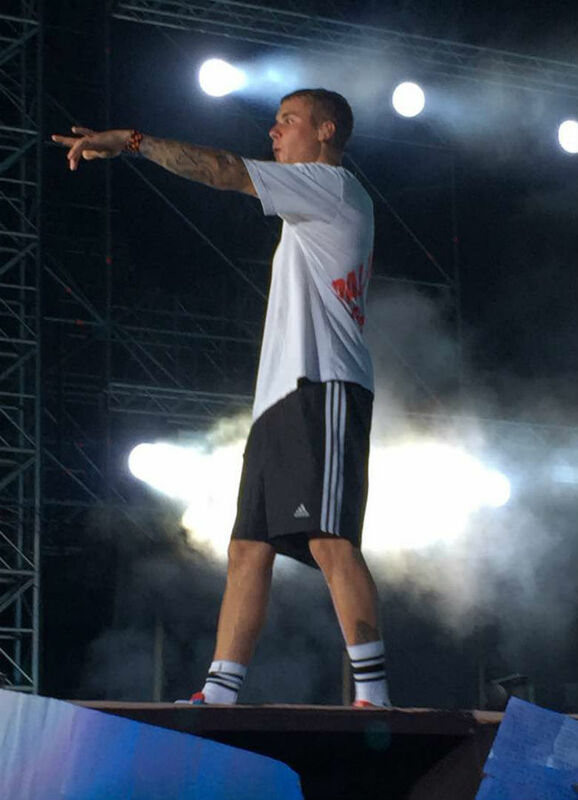 Mumbai (PTI): The crowded DY Patil Stadium erupted in cheers as Justin Bieber arrived. Around 8 p.m., the singer took to the stage amid a stunning display of fireworks. The spell-bound audience continued to sway to the tunes of the international pop sensation as he belted out hits from his new album. “I just want to remind you. No matter who you are, how old you are, where you’re from, you have a purpose…It’s a privilege to be here. And I’ll be back. Thank you all for coming and taking out time,” the 23-year-old said before singing his penultimate track “Purpose”. He kickstarted his concert with hit numbers like “Where are you now”, “Mark My Words” and kept the momentum going till the closing track, “Sorry”. Dressed in casual white t-shirt and black shorts, the Canadian singer was supported by backup dancers throughout his performance. The singer performed songs like “Love yourself”, “Baby”, “Company”, “No sense”, “Right now”, “As long as you love me”, “Let me love you”. The crowd swayed and matched steps with Bieber, crooning with him on his hit numbers. He even brought out a guitar to perform ‘Cold Water’ which was met with thunderous response. Four Indian kids joined him and danced on ‘Children’. He hugged all of them and had a quick interaction with them after the performance. Towards the end of his performance, he asked the crowd to chant ‘Mumbai… Mumbai… Mumbai’. Bieber’s performance was jazzed up with 600 moving lights, 300 square metres of LED displays and a stunning display of firecrackers. Many Bollywood celebrities like Sridevi, Boney Kapoor, Alia Bhatt, Jacqueline Fernandez, Aayush Sharma, Arjun Rampal with two daughters, Arbaaz Khan and Malaika Arora with their son Arhaan, Anurag Basu, Poonam Dhillon, Raveena Tandon, Urvashi Rautela and many more showed up at the concert.